Clouds come in a wide variety of shapes and patterns. Some clouds have odd yet unique shapes just like the inverted cumulus clouds. The name of the cloud is quite self-explanatory, but read further to learn more about this particular cloud formation. Surely, you will be amazed as to how it develops and the weather system it is associated with. Inverted cumulus clouds are cloud formations that take the form of cumulus clouds in which the momentum has transferred from the gigantic cumulonimbus tower and grows beneath an anvil cloud instead. Inverted cumulus is an informal variation of a special cloud form called mamma or mammatus which is characterized by sac-like projections underneath a cloud base. The most stunning appearance of an inverted cumulus cloud occurs underneath the cloud base of anvil spreading on the top of a colossal cumulonimbus cloud. The weather systems associated with inverted cumulus clouds include hail, wild squalls and heavy rain. At What Height is Inverted Cumulus Clouds Found? Inverted cumulus is found at elevations between 15,000 feet and 25,000 feet. By large, this cloud formation is composed of water droplets, ice crystals or a combination of both. Inverted cumulus clouds develop underside anvil clouds and indicate a strong thunderstorm. Pilots particularly avoid this cloud formation as it strongly signifies strong turbulence within the cumulonimbus cloud. How is Inverted Cumulus Cloud Formed? The development of inverted cumulus clouds is attributed to the reverse direction of convection enhanced by cloud precipitation and gravity. As the storm’s updraft rises to the troposphere, the temperature and air stabilize thus inducing the rising updraft to spread out horizontally creating atmospheric instability beneath the anvil. This atmospheric instability causes the parcels of warm and moist air within the cloud to develop downward producing almost symmetrical bulges beneath the anvil which may spread over large areas. What do Inverted Cumulus Look Like? This cloud formation could have either a smooth look or a frayed appearance with globular lobes hanging beneath the anvil. It may appear white or grayish and may last for several minutes to hours. How common are Inverted Cumulus Clouds? Inverted cumulus clouds are seen whenever there are cumulonimbus storm clouds and they are especially common in regions that often experience severe thunderstorms such as in the tropics and subtropics. However, inverted cumulus is not seen in the polar regions like Antarctica. 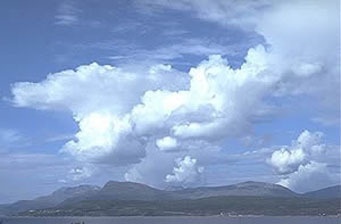 Moreover, this cloud, alongside a cumulonimbus cloud, is often seen during mid-afternoon up to early evening when ground heating and convective activities are at their peak. So whenever you see cumulus clouds hanging from the base of an anvil cloud, they are named inverted cumulus clouds and may signify advancing severe thunderstorm.